With some new breeders buying, a top price of 5,200gn, healthy section averages and some export interest, there was a fairly upbeat feeling about this year’s annual female sale for the Highland Cattle breed in Oban Mart, yesterday. Another factor was the willingness of UK-based buyers to spend top dollar on the best animals, with the top priced animal epitomising that. This was the pre-sale show’s supreme champion as chosen by Banffshire’s Charlie Bruce, from Bogside, King Edward – Capleadh Proiseag 4th of Broomrigg, forward from Douglas and Sheila Fountain, from Broomrigg, Lochmaben, Lockerbie. This three-year-old daughter of Urquhart of Tordarroch is out of a Browhaze-bred dam and has been heavily shown by the Fountains over her lifetime, including seeing her being made champion at Beith, Dalry and Dumfries shows this year. 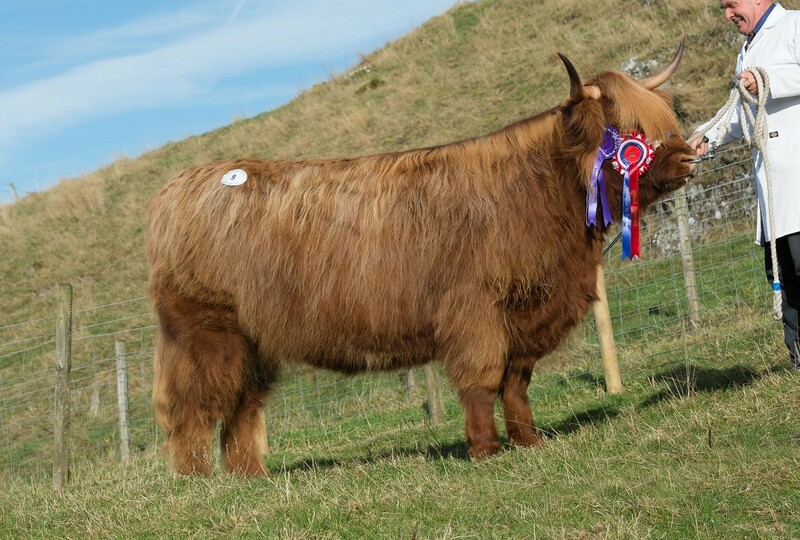 Sold in-calf to Jock of Inversnaid, she joins the Mottistone fold owned by Michael Poland and will be kept at his small farm at West Ferlochan, Benderloch, where Willie MacLean is in charge. Two yearling heifers attracted bids of 3,000gn. First off at that was Jimmy McConachie’s first prize-winning Cailean 3 of Culfoich, a daughter of Eoin Mhor 3rd of Mottistone, from his 50-cow fold at Culfoich House, Advie, Granton-on-Spey. She was bought by Will Davies, for his Cefngwrhyd fold, in Wales. He also gave the final nod for the other at 3,000gn, the second-placed Lisa 1st of Gartocharn from Jimmy and Catherine McKechnie, France Farm, Gartocharn. This one is a daughter of Torquil 2 of Ubhaidh and out of Bhoideach Ruadh 2nd of Glengoyne, which makes her a full sister to the Royal Highland Show champion in 2013. Breed president, Tom Nelson, Glengorm, Tobermory, Isle of Mull, had a consistent day’s selling, with one at 2,500gn and another at 2,400gn. His dearest was the second prize three-year-old heifer, Dorothy Nighean 15th of Glengorm, a daughter of Achadh Chuilter of Ormsary, which sold to Graham Keep, from Grange, near Ipswich. Her herd mate at 2,400gn was Barabel Ban Flath 12 of Glengorm, by the same sire, which sold to Mrs Queenie Strickland, Cladich Dalmally, who got all of her outlay back by selling Jane Sonasag of Cladich, to Neil MacLellan, from Kilchiaran, on Islay. This one is a daughter of Aonghas of An Sidean. At the sale, 14 three-year-old heifers averaged £2,003 (against £2,249 last year); nine two-year-olds levelled at £1,377 (£1,083); 17 yearlings hit £1,082 (£793); 16 heifer calves averaged £761 (£752); and four cows, £1,812 (none last year).